What Do Reputable Catering Companies Prioritize? First, it’s “all about the food quality.” After all, catering is a food business, and if the food isn’t good, then there’s not going to be any business. Is the food of good quality? Does it taste good after it’s prepared? Does it match the taste preferences of the clients? People will always judge a catering company most on their food quality and taste. Next, how organized is the catering company? When someone calls their number is it answered or not? Does it take “forever” to get a response? Once the company arrives at a venue, do things run smoothly or not? Do the people working the event know their roles and do their jobs? Are their kitchen “tools” organized or a mess? Is food that needs to be kept cold properly stored at all times? Is everything labelled as it should be? Basically, is the company well-organized or is it a chaotic mess? Thirdly, customer service is key. If a customer isn’t getting what they’re asking for, they’ll be unhappy. And that unhappiness can literally help put a catering company out of business. It’s so important for a company, like R&R Caterers, to listen to their clients so they know exactly what they want, when they want it, and how they want it. In catering, all the little details matter. 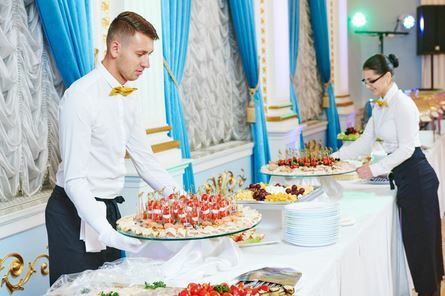 Good manners, politeness, and respect go a long way in showing clients that a catering company has their act together and can get the job done. Finally, “time is of the essence” with catering. There’s a limited window of opportunity, so to speak, with regards to serving food to a lot of people. Obviously, food that should be warm needs to be warm. And one table shouldn’t be waiting an hour while everyone else seemingly got/ate their meal. While caterers might feel “under pressure” for a couple hours, that’s part of the job that definitely needs to be a priority. If you’re looking for a reliable in Bucks County in Pennsylvania, then contact the experts at R & R Caterers today.